OAKLAND, Calif. – Red Bull KTM Factory Racing’s Cooper Webb took control of the 450SX points lead on Saturday following a stellar performance inside Oakland’s O.Co Coliseum for Round 4 of the AMA Supercross Championship. Leading the Main Event from start to finish, Webb claimed his second-straight victory this season while taking the orange brand to an impressive 1-2-3 podium sweep with Red Bull KTM’s Marvin Musquin in second and Rocky Mountain ATV/MX – WPS – KTM’s Blake Baggett rounding out the all-orange podium in third. Webb had a positive start to the evening, grabbing the holeshot and early lead in his 450SX Heat race. After leading the first three laps, Webb made a mistake that dropped him back to third and from there he maintained a top-three position to transfer into the Main Event. As the gate dropped for the Main Event, Webb powered his KTM 450 SX-F FACTORY EDITION to the holeshot once again and assumed the early lead over his teammate Musquin. Webb and Musquin battled together for the first half of the race until Musquin went down around the mid-way point, allowing Webb to increase his lead to eight seconds over the second-place rider. Musquin eventually fought his way back to second and applied pressure on Webb in the final laps. 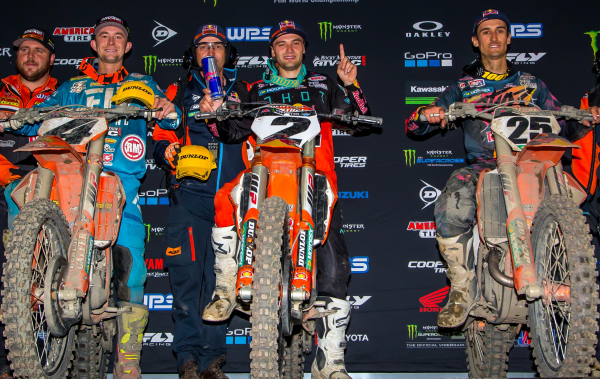 The Red Bull KTM duo battled all the way to the finish with Webb edging Musquin out by a mere 0.8 seconds. Musquin, who placed fourth in his 450SX Heat race, got off to a great start in the Main Event aboard his KTM 450 SX-F FACTORY EDITION as he began in second behind his teammate. Musquin maintained a good pace behind Webb throughout the first half but a mid-race crash caused him to drop back to fifth. Upon regrouping, Musquin made a valiant charge back up to second and he reeled Webb into striking distance in the closing laps. With a hard-fought effort, Musquin battled all the way through the checkers to narrowly miss his first victory of the season in Oakland. Rocky Mountain ATV/MX – WPS – FLY – KTM’s Blake Baggett didn’t get off to the best start in the Main Event but he fought his way through the pack and into a top-five position by the halfway point. He found himself in a podium position late in the race and he finished off strong to successfully round out an all-KTM podium with third-place. Troy Lee Designs/Red Bull/KTM Factory Racing’s Shane McElrath continues to keep himself in the 250SX West title hunt with another solid finish in the class. In the Main Event, McElrath placed his KTM 250 SX-F into fourth off the start and quickly made his way into third. In a close battle, McElrath put his best foot forward to fight for third but he fell just short of the podium with a hard-fought fourth-place. His teammate, Sean Cantrell, captured a top-ten finish in the class. Canadian KTM Red Bull Thor Factory Racing rider, Jess Pettis, had another good showing on Saturday night. Pettis, who qualified 12th on the day, got off to a great holeshot in 250SX West Heat 1 and put his KTM 250 SX-F into the early lead. Pettis led the first three laps before eventually settling into fifth, where he claimed a top-five transfer into the Main Event. Pettis began the race just outside the top 20 but he fought his way up to 11th in the Main Event.